I have fixed most of the broken numbers (some I had with AT&T should have been Verizon etc.). Also, this will work for many places around the world. To see the list you can click here to see if your cell company is one I can reach. The below will be the first text. I want to add you as a friend. Reply YES to accept, NO to decline. We are now friends, Thanks! If you do not get the 2nd one, you have not joined. Do NOT click the link Text4FreeOnline.com and then type YES. You must TEXT back the word YES to join and be on the bulk list. Here is what my phone looked like when I joined it. ← Tamara answers readers’ travel questions today! I love learning. 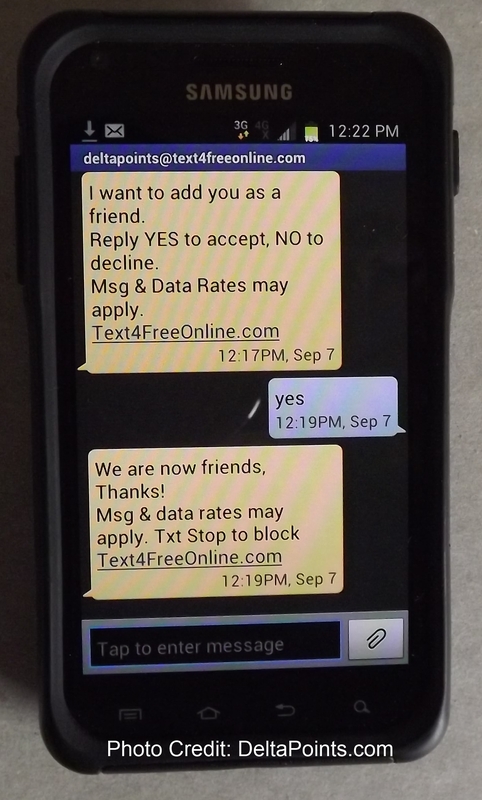 I love the text service Rene!! Thanks for doing this! Do Google voice numbers work? Great thanks Rene. I missed out on SFO-BWI, need a MR or 3 on DL before the end of the year. I got the SFO-MCI text 6 times today. You still testing? I’m traveling right now so can’t receive text msgs, how long do I have to confirm? Hey Rene I got 3 alerts on the SFO-MCI under $200 deal. a glitch? I didn’t receive the SFO-MCI text at all (ATT). Not sure there are any perfect services though… the free system you used before always worked for me but was bad for others. This one probably has similar issues. But whatever you work out is fine with me — it’s YOUR effort and money going in to this so how can I not be appreciative?